Alone is the new side scrolling endless ‘running’ game from developer Laser Dog, the people who brought us the simple yet excellent PUK. As with PUK, the developers have kept things simple with Alone, with a single finger control for controlling your spacecraft through falling debris and rocks. Let’s take a closer look. 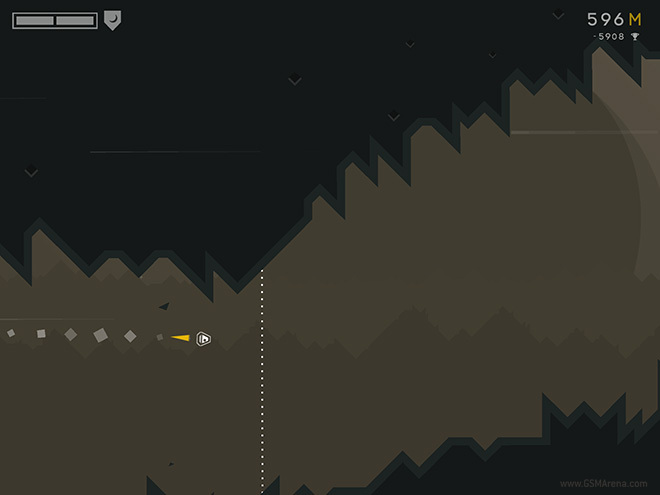 Alone is a 2D side scrolling endless arcade game. The best way of describing this game would be Canabalt in space. Like Canabalt, the world in Alone is crumbling and you are in control of a spacecraft flying endlessly through space. 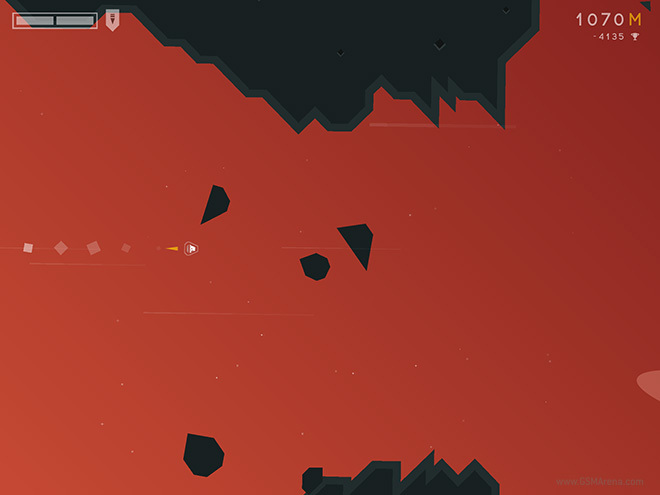 You have to navigate through tight gaps between rocks while avoiding falling debris, giant rocks, and flying comets. You control the ship with just one finger. You can just move it up and down and you have to slide the finger in that direction on the screen to make it move. Now this is the primary control in the game and the only way to play it. There are nine different ways the developers could have screwed this up and ruined the entire game but they didn’t. In fact the controls are perfect. The ship moves with the slightest motion of your thumb on the screen. The motion is perfectly controlled and beautifully precise to the point where it feels almost telepathic. You’d be surprised how well you can move the craft around the screen, assuming you have good reflexes. The world of Alone is a dangerous place to be. There are constant obstacles and things to dodge. When stuff isn’t falling on you, you have to fly through the narrow spaces between rocks. And then there are the comets that are flying towards you. The ship has a shield that can take small knocks. The bigger rocks and comets wipe out the shield entirely but thankfully it regenerates pretty quickly. Unfortunately, the shield is useless against the rock formation that you have to fly through. One encounter with that and it’s game over. Similarly, if you hit your ship when the shield is down den u ded. Thankfully the game shows indicator for major obstructions coming ahead, such as falling rocks and comets. The indicators show the position so you can move out of the way in time although it is often difficult to avoid the comets as the game’s terrain forces you in their path. As you play the game, the terrain gets more and more difficult. You’ll be navigating through tighter spaces and will have to make sudden, sharp turns. There are three levels in the game, with two bonus levels. You need to reach a certain score in the previous level to unlock the next one, which only gets harder as the score limit increases with each level and the levels themself get tougher. After you unlock the next level, however, I felt that there were few reasons to go back to playing the previous levels. So is the game fun? Absolutely. I have a soft spot for endless running games and I often spend long hours trying to get a high score, mostly because they are fun and often to post the scores online. Alone is a lot of fun, thanks to the excellent controls and the exciting gameplay that somehow doesn’t seem to get boring even after repeated plays. Alone has a superb minimalist visual design, with vibrant color-changing backgrounds and simplistic angular object design. The designers have created art using simple straight lines and corners, which is pretty much entirely devoid of curves. Even the smoke trail from the ship is just a bunch of squares in a line. And despite its simplicity the game looks great in action. The backgrounds change color as you progress through the game and each level has a different color theme to it. I particularly liked one of the night levels where the screen mostly goes dark and you navigate using the headlight beam of your ship. The sound is great, too. The levels have a fast-paced, electronic track of their own and they are all excellent. The music works perfectly with the frantic pace of the game and when you sitting on the edge of your seat, navigating through the game’s world, you can’t help but tap your feet to the music. Alone is a fast paced and exciting runner. The simple controls work brilliantly, the game looks superb and the music is fantastic. The game keeps you hooked for hours and has you coming back for more to get that high score and unlock the next level. At $1.99, you get the full game without any IAP, and countless hours of fun. Highly recommended. This game was reviewed on an iPad Air.